The smaller the boat, the bigger the adventure. So simple, so good, so true. I recently felt the need to scratch this itch so I can wear a you-know-what-eating grin for a while. This year’s edition of my Lilliput fantasy included a spin on the PT Eleven, a “nesting” dinghy that patient and determined folks build from a kit offered by Port Townsend Watercraft. Although neither my Zen level nor my epoxy skills warrant a plunge into that kind of project, I wangled a ride on a completed model, which blinded me with its Gucci appearance and surprised me because it was as much fun to sail as it was to row. In superhero terms, it felt like Super-Soldier Serum followed by Vita-Ray treatment as I pottered around the beachfront of Point Hudson. And then a strange-looking craft came out to play. It had three hulls, a raked mast and a square-top mainsail showing the French Tricolore and “Liteboat” stenciled along the leach. In the cockpit, I noticed a set of giant oars and one guy at the controls. Capt. America he wasn’t, but perhaps the French cousin of Superman? “Salut, comment ça va? What is a Liteboat?” It wasn’t the most polished way to start a conversation, but I’m glad I asked. Mathieu Bonnier, 59, owns a small boatbuilding operation in Pontcharra, near Grenoble in the French Alps, called Liteboat. 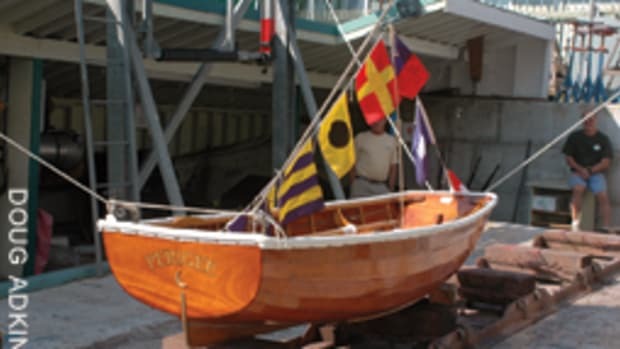 He and six employees build performance rowing craft that are a notch less extreme than all-out racing shells but a notch more stable and, thus, suitable for rough water. 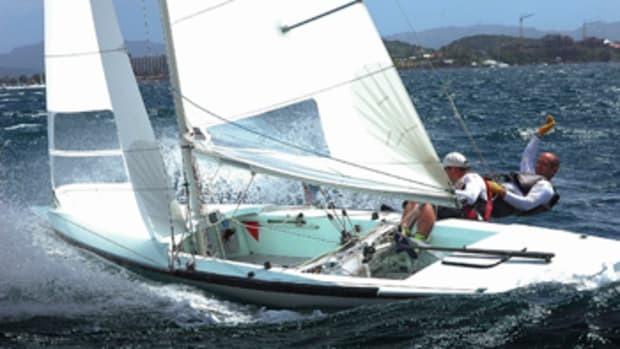 Bonnier is not a household name in sailing circles because he isn’t a sailor. He is ocean-rowing royalty. 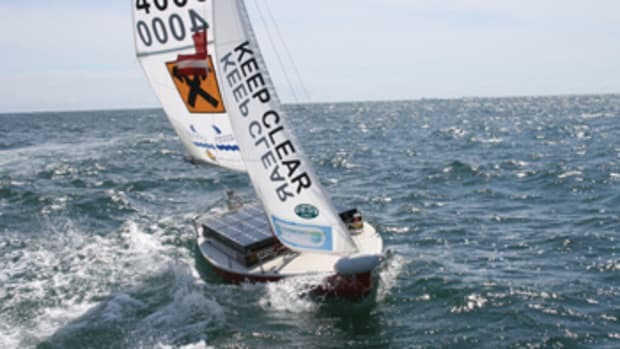 He finished second in the Bouvet Rames Guyane, a trans-Atlantic solo rowing race from Senegal to French Guyana, and rowed solo from Qaanaaq, Greenland, to Nome, Alaska, through the Northwest Passage to raise awareness about the effects of global warming in the Arctic. He also has crossed Alaska on skis in the winter and, as a veterinarian, brings his dog, Tico, on his adventures. He’s a nice guy who is trim, fit, cultured and soft-spoken, but when it comes to discussing personal limits, he’s way, way out there. 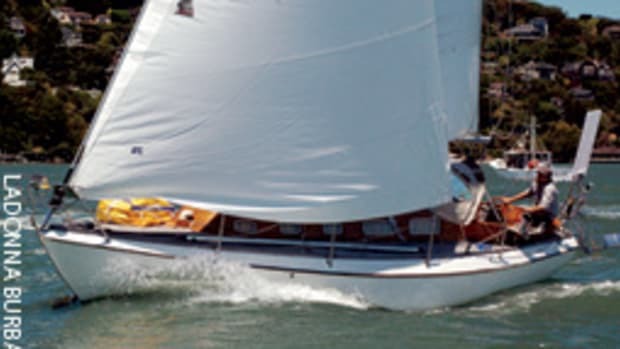 Bonnier came to Port Townsend, Washington, to test a new frontier and generate some buzz for his boats while competing in the second edition of the Race to Alaska, aka R2AK. It’s a crazy affair that’s open to practically any wingnut with a boat, as long as the boat is powered only by wind and muscle. 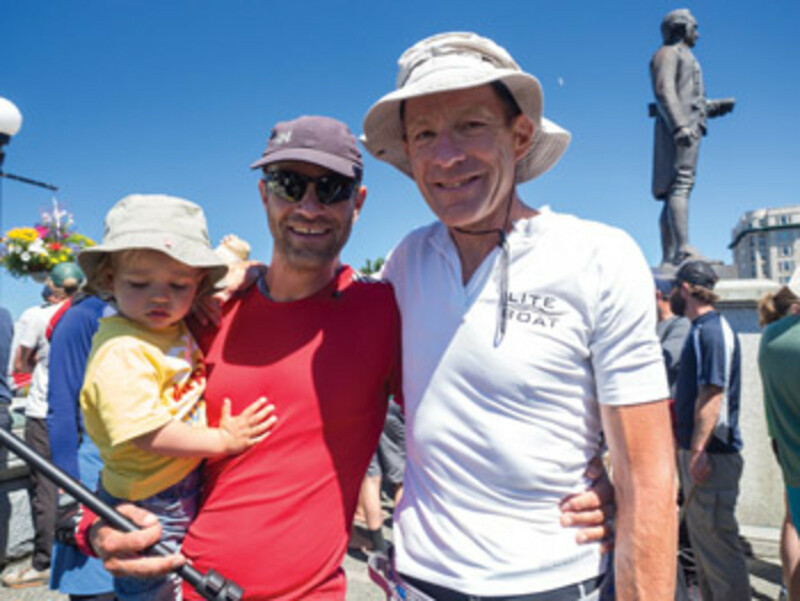 The race takes competitors 750 miles from Port Townsend to Ketchikan, Alaska, through the Inside Passage, with a stop in Victoria, British Columbia. The Mini Transat also is the connecting point to the designer he chose for his boat: Sam Manuard, the Frenchman known for his speedy Class 40s and Mini Transat 6.50 racers. 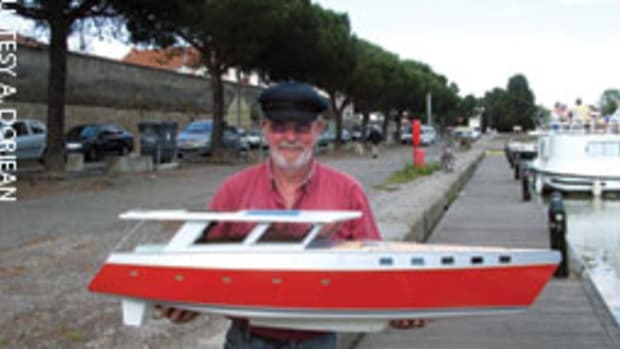 He also is the lead designer of Seascape sailboats from Slovenia, which are popular in Europe and are slowly finding their way to the United States. In fact, one competitor entered a Seascape 18 in the R2AK. “This is a prototype that was built from an existing mold,” Bonnier says of his Liteboat. The hull is too narrow for a cabin, so he has to make due with a cockpit tent. “I will stop for the night to rest and recover,” he says. And he’ll seek out layover ports with some semblance of infrastructure to charge the batteries that power his electronics. “We also chose a small sailing rig that won’t get me in trouble, with a 5.3-square-meter main [57 square feet, roughly the Laser Radial’s sail area] and an 8-square-meter gennaker,” he says. For someone who has crossed the Atlantic — “a stupid thing to do, because it’s boring as hell” — 750 miles up the coast might be considered a walk in the park. But unlike entrants who come here long on confidence and short on preparation, Bonnier takes a cautious and prudent approach. “The danger is spending too much time in your workshop building things and not enough time on the water testing them,” he says with a wry smile. Among other exploits, Angus has circled the globe on muscle power by rowing, paddling, hiking and biking. He has written books, and he has produced shows for National Geographic Television. He hails from Victoria and knows these waters like his back pocket, which he proved when he rowed around Vancouver Island in 15 days — nearly the same distance as the R2AK and covering a good portion of the course along the Inside Passage. Unlike Bonnier, Angus has a sailing past. He worked odd jobs in his youth and later as a deckhand on megayachts to buy boats and quench his thirst for sailing adventures, which were inspired by Robin Lee Graham’s seminal book Dove. 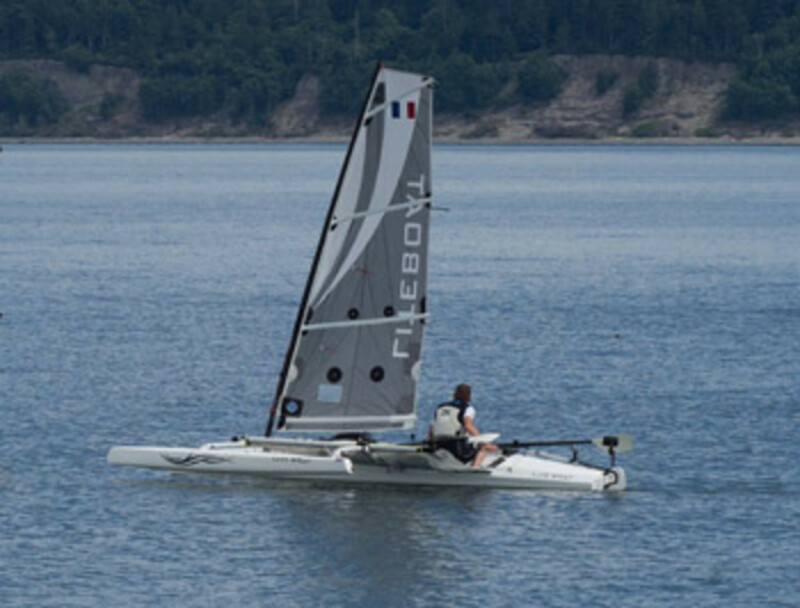 After missing the inaugural race last year, Angus showed off his slick, self-built stitch-and-glue plywood trimaran of his own design, for which he offers plans. It lays out his thinking about the proper vessel for a single-hander’s voyage through rough waters: a small cuddy for sleeping at anchor, a sliding rowing seat and outrigger oars, and a padded hiking board that doubles as a “recliner” so he can rest while providing some righting moment when sailing. 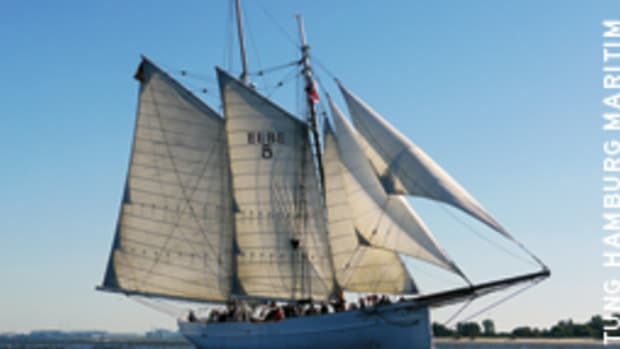 He paid particular attention to sailing and devised an ingenious ketch rig from two take-apart O’pen Bic spars and knock-off sails that he had cut to suit his needs. The masts are unstayed, so the sails can be feathered before things get dicey, as they do in the Johnstone Strait, where boats can get hammered by a steep chop caused by a following current and 30 knots of breeze on the nose. He also can mix and match spar lengths and sail sizes, as well as swap the mizzen and main masts to have the optimum amount of sail up. Angus estimates he has covered about 15,000 nautical miles under oar power. 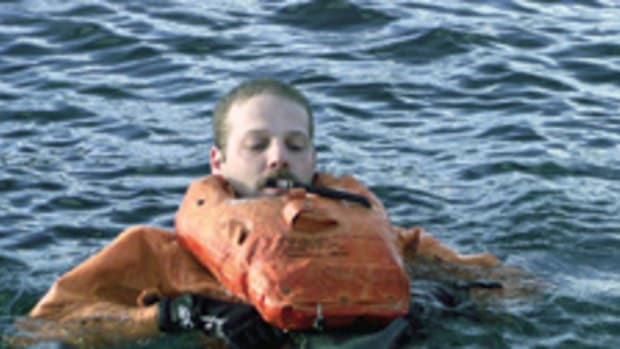 “This time the new component is performance sailing,” he says. And he does Bonnier one better by adding a solar panel so he can power a small tiller pilot that weighs 14 pounds but is invaluable for spelling relief under sail. 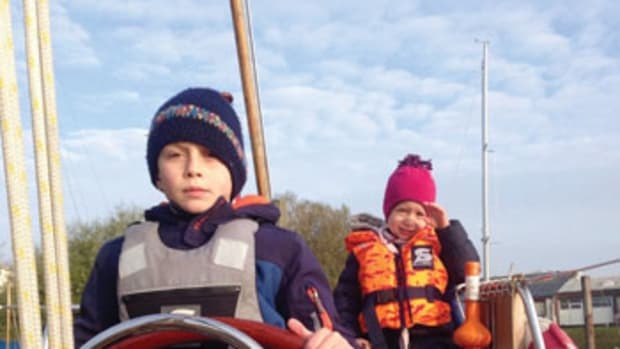 From this perspective, his choice of sailing gear makes even more sense because it should allow him to keep his boat balanced with a fairly neutral helm that makes light work for the electronic helm. “Will you haul out to spend a night on shore to get some quality rest?” I ask. “Beaching a boat of this size and weight is not efficient,” he says. “And you could be in for a nasty surprise,” he adds, because what looks like a nice sandy beach at high tide can turn into a rock-strewn desert at ebb, making it impossible to drag a 200-pound craft and all the provisions to the water’s edge. Although sailboats have the speed edge when the wind is up, it can be painful to watch how some crews labor on jury-rigged rowing or pedaling solutions, expending energy while going nowhere in calm waters. If getting there regardless of wind and weather is the ultimate goal, rather than getting there as fast as possible, simplicity is a useful ally. Angus and Bonnier admit there is an element of luck to their kind of adventuring, even more so in racing, because the requirement of going fast entails going light, which translates to thinner safety margins. But they examine the probabilities and strive to minimize risks. Proper preparation, Bonnier says, is a four-step program. Choose the craft that is right for the job. Prepare yourself physically (run, bike, row). Spend time on the water to find trouble before the ocean does it for you. Prepare your route and work out the logistics. Sounds simple, but it hinges on the ability to soberly assess strengths and weaknesses. And perhaps that’s the real secret of super powers. In addition to being more fun than should be legally permitted, my foray into the world of multidexterous small craft introduced me to two bold men who do brave things without the slightest hint of suicidal tendencies. Add to that a lesson in common sense, and you’ll see that messing about in little boats can be much more than a joyful exercise that results in an ear-to-ear grin.